In the wake of the atomic bombing, the injured took refuge in a grove of bamboo trees. But many of these people died there, and that made the bamboo trees sad. Later, though, the trees came to know that one of the survivors, a boy named Kazuyuki, was cured of the burns he had suffered all over his body as a result of smoke from "Tsuwabuki" leaves, which grew in the bamboo grove. Born in the city of Kobe in 1928. In 1937, after his father passed away, he moved to Oasa (now, the town of Kita Hiroshima) in Hiroshima Prefecture. 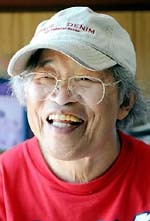 He began his creative activities after moving to Higashi Ward, Hiroshima in 1968. In 1970, he won an award in an essay contest held by the Chugoku Shimbun to commemorate its 80th anniversary with the essay "Human Being." In 1972, he won another award in an essay contest held by Toyota to observe its 40th anniversary. In April 2006, the Michio Hara Museum opened in the city of Miyoshi. About 2.5 kilometers northeast of the A-bomb's hypocenter, a grove of lush and green bamboo trees stand in a residential area. Within this grove there is an underground shelter. When the atomic bomb was dropped on Hiroshima, many people took refuge in this shelter. This became the basis for the picture book, "Pikadon Takeyabu." 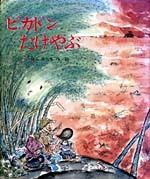 After the book was published in 1983, a drama and a musical were produced based on the book. A chorus festival titled "Pikadon Takeyabu" has been held every year and a group to protect the grove of trees was formed. "I'm very happy with these developments," said Michio Hara, the author of the picture book. More than 40 years ago, Mr. Hara moved to a house that sits next to the bamboo grove. When he would pass by the trees, he often saw elderly people there, praying with their palms together. One day he asked one of them, a woman in the neighborhood, "Why are you praying here?" But she told him, "There are no words for what happened here." Still, she gradually began to share with him the story behind the bamboo trees. She said, "My son suffered burns all over his body, but he was saved thanks to the trees." He learned that the bamboo trees protected the people fleeing from the atomic bombing like a mother, helping to heal their wounds. The story inspired him to write the book. Mr. Hara shared the theme he embedded in the book, describing it as: "Human beings are creatures who must continue to think about living life positively. We should keep to hope, not give in to despair." Thus, he depicted the liveliness of the boy who had been burned severely in the bombing. The boy, Kazuyuki, expresses his gratitude to the trees, saying, "Hurray! I'm all better now! Thank you, bamboo trees!" "Buildings will one day crumble, but in the grove of bamboo trees, new bamboo shoots grow one after another. I want to help preserve the bamboo grove forever as a living witness to the atomic bombing," Mr. Hara said hopefully. Teachers and staff members of the local kindergarten and preschool come to the grove for pieces of bamboo to make lanterns and ornaments for "Tanabata," the "star festival." He said, "I hope those innocent children come to realize, through their experience of the story and the bamboo trees, that atomic bombs must never be used again." There are as many as 23,000 nuclear weapons in the world. Mr. Hara points out: "Nuclear weapons are held, without using them, for the purpose of nuclear deterrence. This means that people in the world don't trust each other." If people can come to trust each other, they won't need to keep nuclear weapons and wage war. They won't need to fight to reach victory and defeat. Mr. Hara says: "The weak members of society, like me, don't fight because we've given up the idea of winning. We don't hate or kill others. We value other people's lives. We want to get along with everyone." I was impressed how the author brought to life the bamboo grove. There is an underground shelter in the grove, and after the atomic bombing, many injured people were carried there. I felt sad when I read the scene where the black rain turned into the tears of the bamboo trees, lamenting the victims who died despite the trees' prayers. But two years later, the bamboo grove heard the boy, Kazuyuki, who had been burned severely in the bombing, shouting, "Hurray! I'm all better now! Thank you, bamboo trees!" I think the bamboo trees were happy to hear that. It probably helped heal some of the pain in their hearts. Not only human beings grieved over the damage caused by the atomic bomb, I felt.